The TrekMovie team wants to wish all our readers a very Merry Christmas. And we are not alone. Many of Star Trek’s stars are sharing holiday wishes too, see their tweets an pictures below, and and a video message from William Shatner. We also have some fun Trekmas videos. Many Star Trek celebs have expressed holiday wishes to their fans, including William Shatner who released a video from "Shanta." Merry holidays to all and to all I love @sirwheaton! Here is a video of the 2012 East Peoria, Illinois Holiday Festival of Lights parade featuring the USS Peoria, a USS Enterprise in lights. Musician Rick Moyer has given a number of classic Christmas tunes a Star Trek twist. For example "Here Comes Enterprise"
You can download more of Rick Moyer’s "Merry Trekmas" music at www.christrocks.com/merrytrekmas. Oh Bill, let the hair grow? I admire your optimism! Merry Christmas and thanks Anthony for all that you do. Merry Christmas, my fellow Star Trek fans! Merry Christmas to all Trekmovie staff! And merry Christmas to all my fellow Trekkies here on the site! Oh my god its the William Shatner from the parallel universe and hes wearing Spocks beard, (mirkin?) I hope he dosent cause any tribble. Merry Christmas and Happy New Year. Shatner always cool, even when saying something dorky. Merry Christmas, Anthony and the entire TrekMovie Staff! Thanks for keeping us informed and entertained. MERRY CHRISTMAS… AND A PEACEFUL NEW YEAR. and Anthony, More exclusives please!! This must be the Evil Kirk from The Enemy Within bc he looks like Satan in that goatee! @_@! Oh and Merry Christmas (or whatever you celebrate) to all. Peace on Earth. Please hold your children close, for recent times have been crazy scary, esp for the little ones. And a special note of thanks to Anthony. I can’t tell you how much I enjoy this site. A heartfelt thanks to you and your wonderful staff for providing such a great way for Trek fans to connect, share, argue, and celebrate our love for Star Trek. Your efforts throughout the year are deeply, deeply appreciated! And I hope you all have a festive time with your families today. Merry Christmas, everyone! I got the new TOS door chime and the 150th anniversary of the Federation book with display from my wonderful children. Still love me some Shatner! On another note,…my sons have the disadvantage of, well,…being my sons. They’re into Six Million Dollar Man and Star Wars, among other things. They received the new Mego style Steve Austin dolls that Entertainment Earth has just put out. And some light sabers. There couldn’t have been two greater gifts or two happier boys. Red Rider Bee Bee Gun, my eye. My family has been the one I’ve forged over the years, since I don’t really know or have any connections with my flesh-and-blood family. But I think “family is what you make of it” isn’t such a negative message. I have wonderful memories with these unrelated folks I know. It almost reminds me of one of the themes in the upcoming Trek movie! In any case, I wish you all the very best this holiday season, and I hope you have a grand time with all your family members and friends. Whatever your spiritual beliefs, or lack thereof, I wish you all the best and may we all do our best, whatever that is, to help our struggling world get to a time of real peace. I love it. Shatner — the ultimate cool dork. Merry Christmas (or Happy Christmahanakwaanzika, or Happy Yule, or Happy Holidays, or Happy Tuesday) everyone! Merry Christmas! Thanks to one of my favorite Trek websites! So, what’s new ? Have I missed much during the past couple of months ? Any news on the sequel yet ? Kidding ;) Apart from checking out the trailers, I’ve deliberately been avoiding reading some of Trekmovie’s articles (and most of the discussions) because I’m trying to avoid spoilers. Having said that, Anthony Pascale’s recent coverage of “Star Trek Into Darkness” has been outstanding. It’s great that Trekmovie is well and truly back in action. Bob Orci (if you’re reading this): From what I’ve allowed myself to learn about “Star Trek Into Darkness” so far, it looks like you’ve done a fantastic job. Exciting and intriguing stuff. Well done. I’m also pleased to see DMDuncan is still posting really entertaining comments on Trekmovie. I always end up with a grin on my face when reading those. 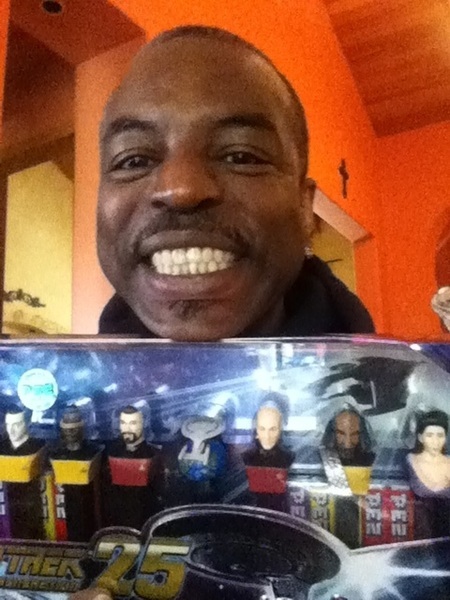 Poor Levar, he didn’t get the special limited edition PEZ that includes Picard as Locutus! Gotta say – Brent Spiner is hilarious. Someone should be looking to cast that guy in a clever comedy. 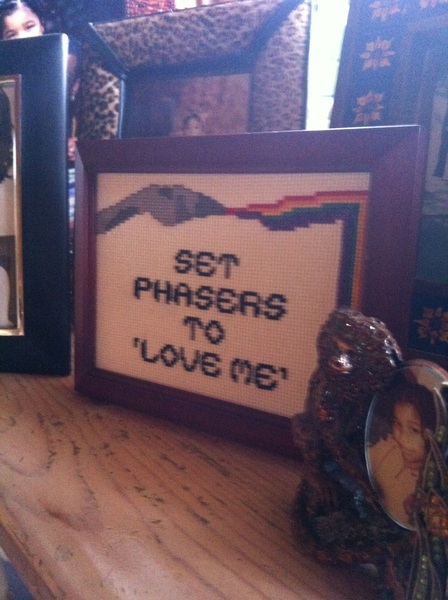 “Set phasers to ‘love me.’.” ‘Community’ reference for the win! And Merry Chirstmas fellow Trekkies and Trekkers, especially the gang at TrekMovie.com! Just think- this time next year, we’ll be unwrapping the DVD with extra scenes, commentary, and other Star Trek Into Darkness goodies. I love the Zoe Saldana photo! She’s all smiles and so happy with her family. It’s just so heart-warming. I haven’t seen the other content yet. Too busy with Christmas stuff. Including unwrapping and setting up and downloading activities relating to my new Galaxy Tab 2 7.0. Which I got as a gift. I recently bought a BlackBerry PlayBook and I’m enjoying it. So now I hae two tablets. Still don’t have an iPad, original or fun-size. But I don’t feel I need it right now. I hope everyone’s Christmas was everything they hoped for, whether or not gifts were involved. The important thing about Christmas, after all, isn’t gifts, it’s being with family and friends, whether in person or in spirit. Cool! Merry Christmas, Merry Trekmas, and Happy Holidays, everyone! All the best in 2013! Merry Christmas, fellow Trekkers and a belated happy Hanukkah. If I didn’t know better I’d get the impression that the Shat was high as a kite… gotta love that crazy old fella. And also: Is Brent Spiner a COMPULSIVE jokester? Had a great trek christmas. Got a 1/350 (3 footer) model of the original Enterprise with the Light Set (which is an amazing lightset. Should look like the Master Replica model when finished and for a 1/4 of the price), and Star Trek: Catan. Cool board game. I’m Samuel Lewis I wrote, co-directed, and starred in Star Trek Saves Christmas. I just wanted to say thank you for posting our video,and also in the spirit of the holiday being so forgiving on my major star trek errors! I will never confuse Klingon for Romulan ships again! I’m seriously kicking myself looking at it. Next time i will do more research to do you guys proud! You guys truly rock for being so understanding! Star Trek really does have the best fans. Happy Holidays Everyone! Just watched the Shat’s clip … he’s odd and funny!